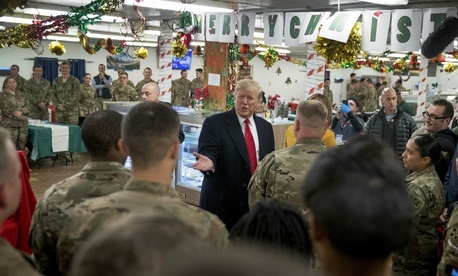 Donald Trump flew to Iraq’s Al-Asad Air Base on Dec. 26 for a surprise visit to U.S. soldiers in a combat zone for the first time during his two-year presidency. The trip has come under increased scrutiny from military and ethics experts. There’s a protocol that U.S. presidents are supposed to follow when they visit a war zone, or speak to active-duty military. It’s designed to keep them safe, and to prevent official visits from turning into political pandering. Like much else in his presidency, Trump didn’t follow some of the rules to the letter. The widespread use of social media is also raising questions over whether the presidential travel protocol is due for an update. Hours later, as we approached the destination, Sarah Sanders came to the press cabin to tell us we were landing at Al Asad Air Base in western Iraq and [to] tell us what to expect. The destination and information about the trip was to be embargoed until the President had finished speaking to troops during his last event before getting back on Air Force One. That’s how the system is supposed to work, explains George Condon, a WHCA member and veteran correspondent for the National Journal. Reporters in the White House pool take turns covering Trump’s domestic and foreign trips, which means that news organizations share the cost of the coverage. (Reporters pay to fly on Air Force One or on accompanying charter flights, and for their own lodging, wifi and other travel expenses). When the president flies into places where his security could be in danger, reporters have historically been banned from writing anything that would disclose his location until he is long gone. When Franklin Roosevelt travelled during the Second World War, he would often only take reporters from the wires, an early version of the pool system, Condon said. Those reporters weren’t allowed to write from where Roosevelt was, he added, to protect his safety, like during his 1942 cross-country “secret” trip to personally check up on war preparations. “When a president is flying into a country where folks have stinger missiles, no one should question the need for complete secrecy on the travel plans and arrival times,” Condon said. After a flurry of tweeting the weekend before Christmas, the president’s account suddenly went quiet after a “MERRY CHRISTMAS” message just after 6pm on Dec. 25. The press office wasn’t answering calls; the “Daily Guidance” notice that tells reporters about the president’s schedule was already suspended due to the government shutdown that started on Dec. 21. And then Alan Meloy, a self-described amateur photographer and plane enthusiast spotted an unusual plane over his kitchen window in Sheffield, England. “I could see a trail coming towards me… and then I looked through the viewfinder and thought this is worth photographing, it’s not just a normal airliner,” he told CNN. Meloy recognized it as one of the specially-modified Boeing planes that fly as Air Force one, and posted a photo of it in flight. The White House has not issued any daily guidance for today, but the press office did issue a lunch lid until 1 p.m. For those interested: No, as of five minutes ago, there was no Marine posted outside the West Wing. A Marine stands guard outside the West Wing when the president is in residence. Sarah Huckabee Sanders, White House Press Secretary, confirmed the growing online speculation on Twitter at 2:18 pm, EST, on Dec. 26 with a photo of the president and First Lady in Iraq. Soldiers in the Iraq base and at a second stop at a military base in Germany, however, were pictured clutching “Make America Great Again” hats and even holding up pro-Trump banners, unusually political activities for active-duty soldiers. A U.S. Air Forces Europe spokesman said the hats the soldiers in Germany held were “personal items” that they wanted the president to sign, not political symbols. While in Iraq, the president gave a politically tinged speech that reminded some of a campaign rally. The politicization of the event raised questions from some former White House ethics experts about whether Trump’s 2020 presidential campaign, and not U.S. taxpayers, should be footing the bill. In a video that Trump tweeted after Air Force One left Iraq, he and the First Lady are shown surrounded by soldiers taking photos with their phones. They greeted the couple with applause, and responded warmly to his speech. Among the soldiers were Navy Seals, however, and military veterans said the president should have blurred their faces, Newsweek reports. ”The real names, faces, and identities, of personnel involved in special operations or activities, are usually a closely held secret in a combat zone,” Malcolm Nance, a former Navy intelligence specialist, told the magazine. Military pay has “risen every year for three decades,” notes Military.com in an article fact-checking Trump’s remarks. The trip also did little to improve Trump’s once-promising relationship with Iraqi prime minister Adel Abdul-Mahdi, or with the other governing coalitions in the country where the U.S. has had a military presence for years. Trump and the prime minister only spoke by phone, after a disagreement over where to meet, Al Jazeera reports.